Conservative commentators are offering Democrats the same old advice: Move to the center. Just a few weeks ago, I wrote about the tendency among conservatives, particularly of the “Never Trump” variety, to blame liberals and progressives for their own decisions. The idea behind it was pretty simple: Members of the conservative media suggest that if Democrats just made teeny-tiny changes, they could expect a windfall of support from right-leaning independents and disillusioned Republicans. They play the role of Lucy van Pelt, assuring Charlie Brown Democrats that this time would be different, that this time they wouldn’t pull the electoral football away at the final moment and would actually check the box for Dems who heeded their advice. Lulled into a tepid trust, Charlie Brown would declare, “This time I’m gonna kick that football clear to the moon!” before Lucy would pull the ball away, as always. With the 2018 midterms behind us, I want to revisit this concept and one very specific narrative that’s emerged in the post-electoral wake. That narrative is, simply put, that Democrats have veered too far to the left and need to make a strategic shift to the center if they’d ever like to retake power. The math just doesn’t add up on the “move toward the center” messaging. 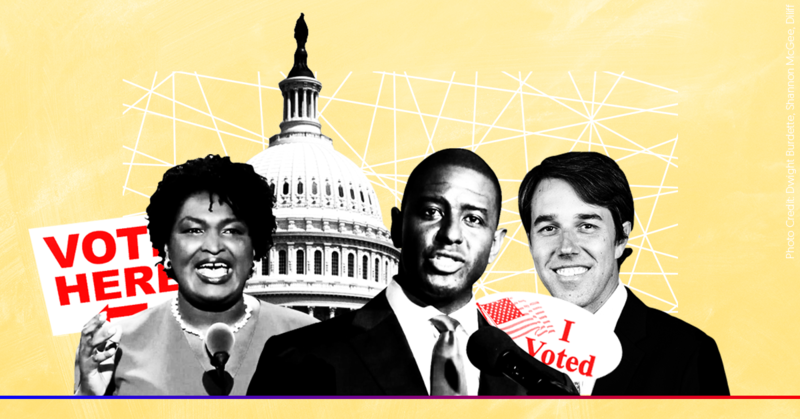 On Fox News, National Journal’s Josh Kraushaar made three separate pleas for Democrats to avoid moving “too far to the left.” His analysis appeared to hinge on his claim that unabashed progressives Beto O’Rourke, Stacey Abrams, and Andrew Gillum all lost their respective races. (In fact, as of this writing, both Florida and Georgia are still counting votes.) What makes this type of electoral interpretation all the more frivolous is that there’s little reason to believe that O’Rourke, Abrams, and Gillum didn't fare well because they weren’t closer to the center. The Associated Press declared Republican Ron DeSantis the initial winner of the Florida governor's race, beating Gillum by just 0.4 percentage points in a close contest that may be heading for a recount. In the state’s race for Senate, incumbent and moderate Democrat Bill Nelson (GovTrack’s 2017 Report Card has Nelson pegged as the third most conservative Democrat in the Senate) trails challenger and current Florida Gov. Rick Scott by 0.2 percentage points. It’s not exactly an apples-to-apples look, but it’s pretty close, and looking at these two statewide Florida races would seem to suggest that the ideological gap between Gillum (who Kraushaar might say is “too far to the left”) and Nelson (who seems to be the type of candidate analysts like Kraushaar would have wanted in Gillum’s place) was negligible when it came to vote totals. In Abrams’ bid for Georgia governor, she ran so close to Secretary of State Brian Kemp that it’s more than two full days after the election and CNN has yet to even call the race. As of this writing, Kemp’s lead over Abrams is just 63,198 votes. To put this in perspective, the last time a Democrat came this close to winning the Georgia governorship was 20 years ago, when Democratic nominee Roy Barnes beat Republican Guy Millner. And in Texas, when Ted Cruz first ran for Senate in 2012, he handily defeated Democratic opponent Paul Sadler by 16.1 percentage points. In the run-up to that election, Sadler received an endorsement from The Dallas Morning News, which called him a “moderate Democrat” who could “continue a legacy that puts the state first, rewards civility and embraces moderation and bipartisanship.” In 2018, O’Rourke lost to Cruz by just 2.6 percentage points. But on Fox, Kraushaar pointed to the Senate as the place where Democrats blew it for not being moderate enough. Looking at the nine states that had been listed as toss-ups by The New York Times -- Arizona, Florida, Indiana, Missouri, Montana, Nevada, New Jersey, Tennessee, and Texas -- it’s hard to see exactly how, through any reasonable analysis, that it was progressives that cost Democrats the chance to regain power. I’ve already addressed O’Rourke making Texas unexpectedly competitive, but beyond that, Nevada’s Jacky Rosen took a surprisingly progressive stance on immigration as she flipped the seat from red to blue, and in New Jersey, scandal-plagued Sen. Bob Menendez handily won re-election (he has a track record of being on the more progressive end of the Democratic caucus). The only moderate Democrats who did come away with strong showings were Sen. Jon Tester, winning re-election in Montana, and Rep. Kyrsten Sinema, whose race for Arizona Senate was still too close to call as of Friday. Beyond that, moderates didn’t do so well: Nelson might lose in Florida, Phil Bredesen lost in Tennessee, Joe Donnelly failed to win re-election in Indiana, and Claire McCaskill was ousted in Missouri. This narrative isn’t supported by facts, but that’s not stopping right-leaning and conservative media from pushing it hard. Fox Business anchor Connell McShane questioned whether Democrats need to be more “pragmatic” if they hope to win in 2020. “If you want to win back some of those independents in the middle, and some of those Democrats that voted for Trump in 2016, you’ve got to be very, very careful that you don’t just cater to the liberal base,” Christian Broadcasting Network’s David Brody cautioned during a recent episode of The 700 Club. But what lesson was there for Republicans to learn? Simply go further to the right, apparently. On the one hand, Democrats should move to the right because you can’t elect an extremist, and it’s important to understand that not all districts around the country are the same. On the other, Republicans need to become mini-Trumps or suffer the consequences. Am I getting that right? It’s almost as if this isn’t meant as an altruistic gesture to help Democrats defeat Republicans at all, and rather it’s just a clever way for conservative pundits to try to push the nation’s politics closer to their own ideals. That couldn’t be the case -- or could it? Thankfully, the world has Meghan McCain. On the November 7 edition of The View, McCain laid out some of the same move-to-the-center rhetoric heard elsewhere, but it’s at the very end that she gives away the game a bit. MEGHAN MCCAIN: The serious lesson for Democrats also is that Republicans are not going to vote against their own agenda and against their own interests. Meaning, I think there’s an impression sometimes, if you don’t watch Fox News, that all Republicans if you’re against Trump or you have issues with his rhetoric that automatically I have somehow morphed into a liberal, that every ideology and principle I have ever agreed on, the principles that make me who I am, the conservative that I am, have flown out the window. And all of a sudden, I’m a Democrat. That is not the case. Republicans are going to vote for their own agenda and they did a lot last night, especially in Senate and gubernatorial races. And I think the Democrats that were really competitive were the ones that were more moderate. So that is a lesson I would take away. MCCAIN: Of course it’s disappointing. You’re a Democrat. It’s not disappointing for me. I’m a Republican. I’m going to end up voting for Republicans, and there’s a way to differentiate Trump from candidates. Serious lesson for Dems I can’t believe they haven’t learned yet: Republicans are not going to vote against their own interests (taxes, judges, guns, etc) because President Trump says bad things. Dems have to offer Republicans something. “I can’t believe it. She must think I’m the most stupid person alive,” says Charlie Brown. The idea that there’s some level of conservatism that Democrats can achieve in hopes of pulling in Republican voters is a myth, and Illinois’ 3rd Congressional District is proof. IL-03, which covers some of Chicago’s southwest side and surrounding suburbs, is about as reliably Democratic as it gets. The district hasn’t been held by a Republican since 1975. For the past 25 years, it’s been held by the Lipinski family -- Bill from 1993 until 2005, and his son Dan from 2005 until today. In the past four elections in which the current Lipinski faced off against a Republican in the general election (he ran unopposed in 2016), the Republican challengers won 35.4 percent, 31.5 percent, 24.3 percent, and 21.4 percent of the vote, according to Ballotpedia. In this year’s election, Lipinski’s Republican opponent, Arthur Jones, received 56,350 votes, or 26.5 percent. There is nothing out of the ordinary about this number. In fact, it falls neatly in the middle of the previous range. The one thing that is out of the ordinary: Lipinski’s opponent was a Nazi. Now, you’re probably thinking something along the lines of, You know, you can’t just call everyone you disagree with a Nazi. Let me be clear: He’s a literal neo-Nazi. In a 2012 interview with Oak Lawn Patch about plans to run for Congress, Jones said, “As far as I’m concerned, the Holocaust is nothing more than an international extortion racket by the Jews. It’s the blackest lie in history. Millions of dollars are being made by Jews telling this tale of woe and misfortune in books, movies, plays and TV. The more survivors, the more lies that are told." Finally making it on the ballot in 2018, Jones racked up a lot of attention for, well, being a Nazi who ended up running unopposed in that district’s primary and winning the nomination. Easy enough: Don’t vote for the Nazi. But then people voted for the Nazi. This was a perfect time to test the theory that if Democrats run centrist candidates, they’ll win over Republicans when the Republican nominee is, say, a Nazi. For a Democrat, and especially one representing a reliably blue district, Lipinski holds many extremely conservative positions. He is anti-abortion, anti-Obamacare, anti-LGBTQ, and anti-immigration reform. A proud “Blue Dog,” Lipinski is about as close to being a “Democrat In Name Only” as possible. Sadly, for many people on both sides of the aisle, their vote isn’t as much about a candidate’s ideology or specific positions as it is about the tiny “D” or “R” next to their names. I have no advice for political parties or candidates, but I would urge political media figures to dial it back on half-baked analysis that always just so happens to support their personal political worldviews. It does none of us any favors. Perhaps it’s best that rather than trying to prescribe who candidates should be and what they should believe, we let candidates tell and show us who they are. It’s certainly a more productive use of our platforms.